This year, Friday 17th May 2013 will be a very special day in the history of Liverpool. It is the opening of the Central Library after it’s £50 million restoration. It’s doors will be opening at 10am and you can be the first to explore this beautiful building, the restored Hornby Library and Oak Room to the new Children’s Library and rooftop terrace. This coincides with the Liverpool LightNight and between 9.15pm to midnight you will be able to view the spell-binding light and sound projection on the historic facade of the building. 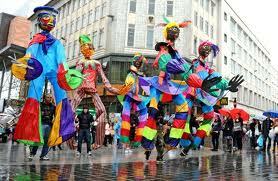 LightNight is Liverpool’s one-night arts and culture festival when the doors of over 50 city centre organisations keep the doors of their museums, galleries and venues open until late, staging around 100 special cultural events for all ages. This is an annual event and part of the Museum at Night initiative and gives the local cultural community an opportunity to showcase the talents and activities of this city locally, regionally and nationally. Last year I had a wonderful LightNight visiting places I did not even know existed, listening to music, watching street theatre, dancing at St George’s Hall, visiting exhibitions and sharing all this with my fellow Culture Champions. I am now ‘studying’ my LightNight programme to make sure I don’t miss anything out this year and will, hopefully plan my route accordingly. 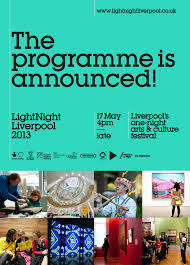 You can plan your night by visiting www.lightnightliverpool.co.uk or picking up a programme at one of the venues.